The head and neck houses the common carotid artery. 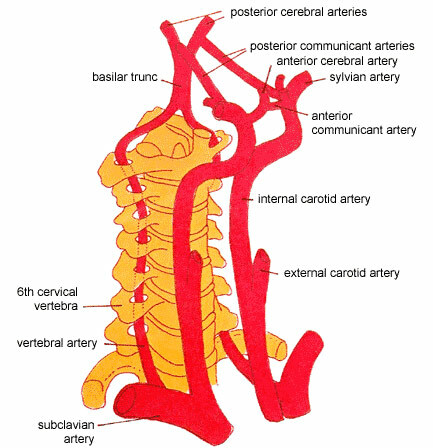 There are two common carotid arteries, and these arteries supply oxygenated blood to the head and neck. The common carotid artery bifurcates into the external carotid artery and the internal carotid artery. The external carotid artery supplies blood to the exterior of the head, the face and the greater part of the neck. On the other hand, the internal carotid artery supplies blood largely to the parts within the cranial cavity and the orbital cavity. Children have a smaller external carotid artery relative to their internal carotid artery. This size changes in adults wherein the two arteries become almost equal in size. The external carotid artery starts opposite or at the height of the upper portion of the thyroid cartilage. It slightly curves to pass upward and forward. It then reclines backward behind the neck of the mandible. At the neck of the mandible, the external carotid artery divides into the superficial temporal artery and maxillary artery inside the parotid gland. As the external carotid artery runs upward along the neck, it decreases in size and gives off a number of branches. Four sets constitute the branches of the external carotid artery. These four sets are as follows: anterior set, posterior set, ascending set, and the terminal set. The first set or anterior set consists of the superior thyroid branch, the lingual branch and the external maxillary branch. The second set or posterior set consists of the occipital branch and posterior auricular branch. The third set or ascending set consists of the ascending branch and pharyngeal branch. Lastly, the fourth and final set or terminal set consists of the superficial temporal branch and the internal maxillary branch. Each of these branches further subdivides into more branches.